As siRNA interference has been successful in gene silencing application, the major limitation in utilizing siRNA for therapeutic applications is the large anionic molecules’ inability to diffuse across cellular membranes. While intracellular delivery of these siRNA oligomers has been the focus of numerous research groups worldwide, chemical conjugation of siRNA to cationic peptide CPP (cell-penetrating peptides) or penetrating provides an interesting approach for enhancing antisense and siRNA’s delivery to cells and tissues. Bio-Synthesis provides synthesis and conjugation of siRNA to peptide in high quality and yields. Peptide-siRNA complexes are produced in our state-of-the-art chemical biology facilities and through expertise in cross-linking chemistries. Each conjugate is meticulously monitored during synthesis, and controlled according to our stringent quality assurance and quality control standards. The final product is identified by mass spectrum while purity is analyzed by gel electrophoresis. 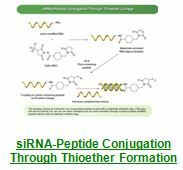 All of our siRNA-peptide conjugates include: synthesis and modification of siRNA and peptide conjugation; each biopolymer is carefully monitored for its sequence integrity and systematically controlled by PAGE or mass spectrometry analysis. Quantity is validated by UV absorbance at 260 nm. Double-stranded siRNA is generally sufficiently stable to be used without modification, but are usually heavily modified with nucleoside analogs for in vivo use. The 5', internal or 3'-terminus of an siRNA oligos can be covalently linked to N-, internal or C-terminus of a peptide using preactivated small molecules with functional groups residing in peptides. Oligos such as amine, thiol, carboxylate,hydroxyl, aldehyde and ketone, active hydrogen, photo-chemical and cycloaddition reacting and cross-linking with one another through variety of different conjugation chemistries that include either stable or cleavable linkage. Although, the price for using other strategies for making peptide-oligo conjugate is the same, the price for obtaining other modified peptides, oligo and cross-linker includes either stable or cleavable linkages, or higher additional spacers. Functionalization of oligos and peptides are manufactured under strict, quality control process. Analytical HPLC and MS analyses are performed in every development cycle. Depending on the type of conjugation chemistry we use, after buffer exchange (if necessary), conjugates undergo gel filtration or use of the centrifugal concentrator to remove excess cross-linking reagents and oligonucleotides. Then, by either size-exclusion chromatography (SEC) or reverse phase HPLC, they may also be used to either remove excess reagents or isolate and characterize the cross-linked product. Once the product has been purified, it may be subject to many different types of studies including spectroscopic (MALDI-TOF, ESI, LC-MS Fluorescence) and electrophoresis. QC (quality control) and QA (quality assurance) procedures are also followed independently to guarantee you the highest quality of every delivered conjugates. Final quantity is systematically validated by UV absorbance at 260 nm. Moreover, our dedicated technical account managers will guide your project through every step of the process and constantly keep you informed of the latest project progress.